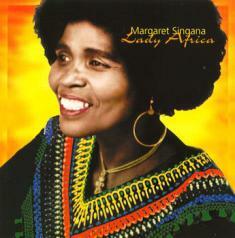 Margaret Singana was born Margaret Mcingana on 1st January in 1938 in Queenstown in the Eastern Cape. In the 1950s Margaret moved to Johannesburg in search of fame but, due to the influx control laws, she ended up as a domestic worker. Her employer soon recognised her talent for singing and introduced her to a recording company. In the meantime she associated herself with Dorkay house to promote herself as an artist. She soon started performing with The Symbols, in 1972 and made Good Feelings with the band. She became the first black artist to feature on the Radio 5 hit parade. Margaret's song 'I never loved a man the way I loved you' became a hit. In 1973, Margaret was cast as the lead singer in the musical Iphi 'Ntombi and soon made herself famous with the song 'Mama Tembu’s Wedding'. The production toured Australia, the United Kingdom and the United States. During this time Margaret also starred in Sponono, a production by Alan Paton, which showed in New York. The recordings that she did after this time reached top of the charts in Germany, the Netherlands and the United States. Margaret has received many awards, including the 1976/1977 critics award from the British magazine Music Week. Margaret, known as “Lady Africa” in Southern Africa, suffered from bad heath in 1980, but despite this continued to record. She made a comeback in 1986 when she returned to sing We Are Growing, the theme song from the television series Shaka Zulu. The song eventually went to number 1 in the Netherlands in 1989. Other recordings she made during this time include Nothing to fear and Music for Africa. The wheelchair bound Margaret died in 2000, after a long illness.